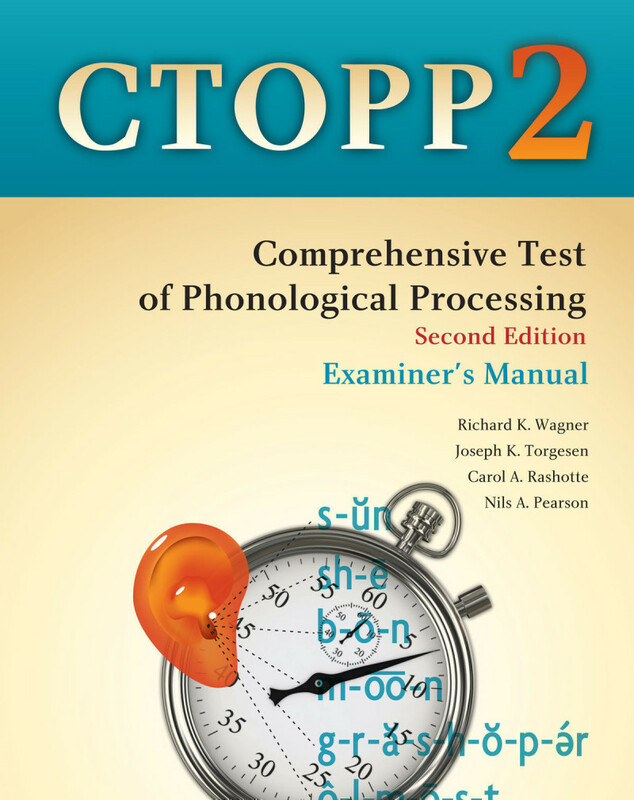 The newly updated CTOPP-2 has been designed to assess phonological awareness, phonological memory, and rapid naming. Individuals ages 4 to 24 years. The age range has been lowered in this edition to include 4-year-olds. Floor effects were eliminated by the addition of easier items; ceilings were extended by the addition of more difficult items. A new phonological awareness subtest (Phoneme Isolation) and rapid naming tasks for the youngest examinees were added. Subtests include Elision, Blending Words, Sound Matching, Phoneme Isolation, Blending Nonwords, Segmenting Nonwords, Memory for Digits, Nonword Repetition, Rapid Digit Naming, Rapid Letter Naming, Rapid Color Naming, and Rapid Object Naming. The Phonological Awareness Composite Score represents the examinee's awareness of and access to the phonological structure of oral language. The Phonological Memory Composite Score represents the examinee's ability to code information phonologically for temporary storage in working or short-term memory. The Rapid Symbolic Naming Composite Score measures the examinee's ability to include efficient retrieval of phonological information from long-term or permanent memory and execute a sequence of operations quickly and repeatedly. The Rapid Non-Symbolic Naming Composite Score measures the examinee's ability to include efficient retrieval of phonological information from long-term or permanent memory and execute a sequence of operations quickly and repeatedly using objects and colours. The Alternate Phonological Awareness Composite Score, for examinees ages 7-24 years, measures the examinee’s phonological awareness exclusively with nonwords. The CTOPP-2 yields six types of normative scores; a new Rasch-based developmental score is now available for the non-speeded subtests. All new normative data (N = 1,900), collected in 2008 and 2009, has demographic characteristics that are representative of the U.S. population.